The 3rd Ventura County location of Five Guys is opening on Thursday, November 15th at The Collection at Riverpark, 2730 Portico Way, Oxnard. To get to The Collection at Riverpark, take the 101 west, exit on Oxnard Boulevard and turn right. Turn right again on Town Center Drive into this beautiful new retail center. Five Guys was founded in 1986 in Arlington, Virginia and is known for grilling burgers made-to-order with freshly ground beef. Five Guys claims there are no freezers in their locations. Nothing is frozen (well, maybe except for their ice cubes). Five Guys uses only peanut oil and claims their menu is completely trans-fat free. There are now over 1,000 Five Guys locations across the country, including this Oxnard Location, Thousand Oaks (487 N. Moorpark Road) and Simi Valley (2650 Tapo Canyon Road). Burgers are made to order and delicious at Five Guys. My only mistake here was not adding cheese! We've been to the Five Guys in Thousand Oaks a number of times and I can vouch for the deliciousness of their burgers. Very fresh and very beefy. You custom order your burger any way you want with nearly 20 different toppings. My only "beef" so to speak is that I often order veggie burgers. 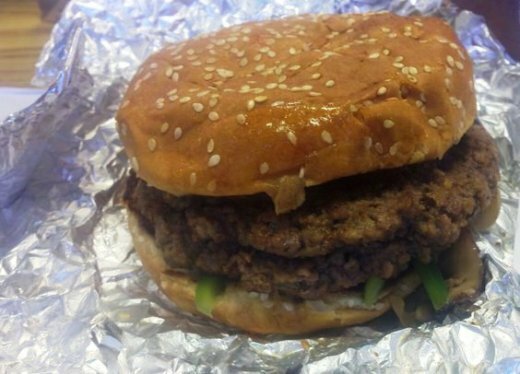 Five Guys does not have a veggie burger, though you can order a "veggie sandwich" that consists of a bun and whatever veggie toppings and cheese you'd like. Five Guys is also known for massive quantities of fries and I love their help yourself peanuts in a shell (thankfully I have zippo peanut allergies, yeah!). They also have tasty sound hot dogs that I have not yet tried. They keep their menu pretty simple at Five Guys. Five Guys notes on its website www.fiveguys.com that they do not offer coupons or discounts, which to me is kind of refreshing. Enjoy your burgers!